TrustFax provides many service options, including a monthly as well as a yearly payment option that saves you money in case you pay upfront. The online fax service does have a 20-day storage limit for your faxes that you send and receive. The company also offers upgraded storage plans too at very reasonable prices. With this service, you don’t have to go for any signed contracts, so this makes it easier for you to cancel at any time of your convenience. In case you choose to upgrade your plan, you can always do so without changing your fax number. The monthly subscription charges of this service is $12.99 per month. This fee is one of the highest in comparison with other fax services. Although, this plan includes 300 pages of fax to send and receive. On crossing this limit, the service charges are 10 cents per page. It also starts charging 7 cents per minute in case your fax takes over two minutes to send. This fee can start to add up depending on the size of the faxes you intend to send. 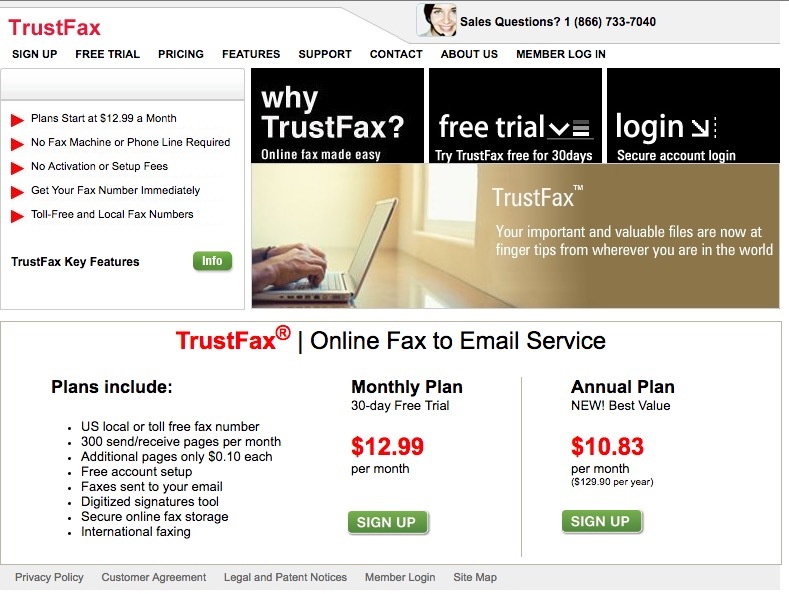 TrustFax’s plan also allows international faxing for a standard fee. It’s generally necessary to sign documents, and this service enables web-based digital signatures. This service also lets you send multiple documents in one fax and also has an automatic re-send feature, in case a fax does not go through. However, it doesn’t allow you to schedule a fax which you wish to send at a future time. While this service isn’t quite hard to master, it does provides you many of the advanced features found with other high ranking faxing services like international faxing and the ability to add a digital signature. It also integrates easily with Outlook and allows you to send a fax from your email system too. Much similar to the way you compose and send an email. This service has an excellent customer support and service. The company also offers 24-hour email support along with toll-free telephone support in business hours. It also has a convenient user forum. All of these options ensure that you are always in reach with either a helpful employee or an experienced user, It also has a comprehensive FAQs and a fax glossary as well. To sum up, TrustFax offers aggressive rates along with flexible storage options with a dependable customer service and support. Its yearly plan is an excellent choice for small business. With this, we end our review of TrustFax online faxing service. Go ahead and try out this wonderful service especially if you own a small business and have to send faxes on a regular basis. Don’t forget to mention your views and experience in our comment section below.